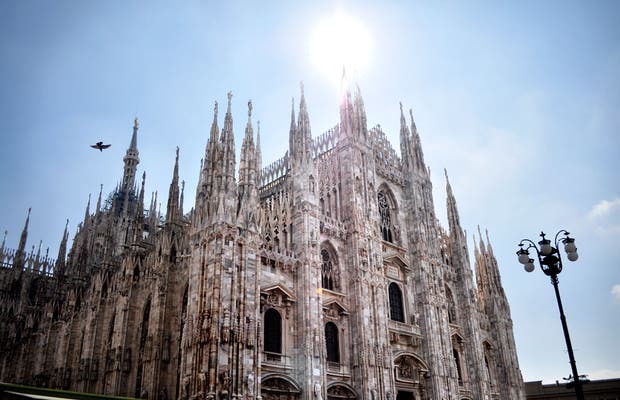 The Duomo of Milan is a famous Gothic cathedral that's a true symbol of this city. This impressively large temple, among the largest in the world, was built during many artistic eras but I'd like to make a special mention of its famous stained glass windows which bend the light in six colors, as well as its six naves and endless columns. It is not known exactly who was responsible for their design and construction, but they stained glass windows of the Duomo are equally as famous as those of the Notre Dame de Paris and the Saint-Chapelle. When you go to Milan, be sure to observe the wonderful atmosphere they create!. Bella all’esterno, non molto all’intero (per l’interno ho preferito Sagrada Familia di Barcellona, Spagna). è possibile inoltre seguire la messa. se avete tempo andate anche al museo del duomo li alla destra! Especially the afternoon and the weekend a lot of people gather there and amazing also you may see famous people if you are lucky. The milanese Duomo is unique to any other italian churches, the use of white marble on a gothic church creates a stunning reflective effect on the structure.